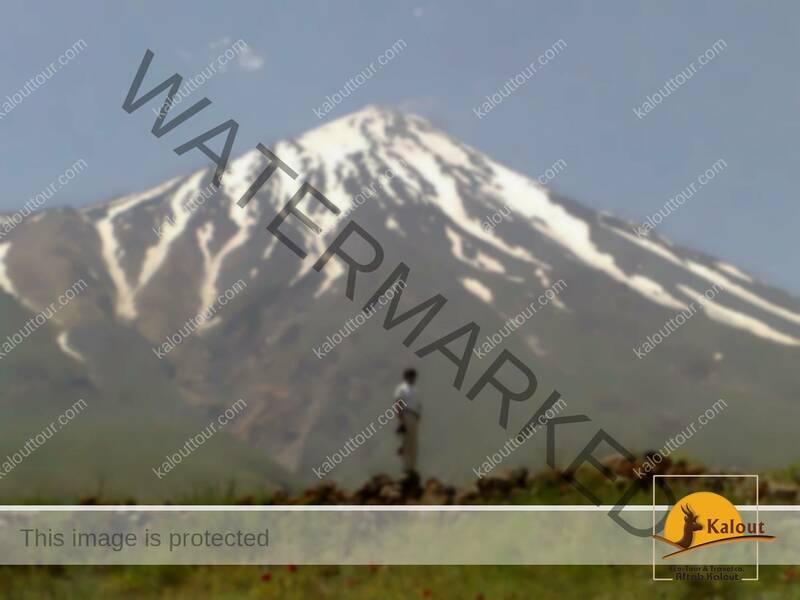 Damavand volcano is a majestic stratovolcano located 70 km NE of Tehran and 70 km south of the Caspian Sea. 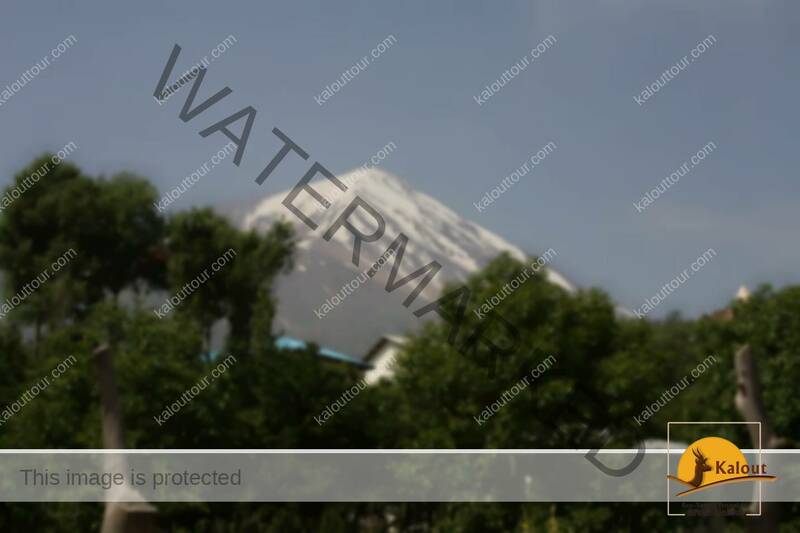 Mt Damavand is the highest peak in the Middle East and the second highest volcano in Asia (after Kunlun volcano in Tibet). Damavand last erupted about 7,300 years ago. There are no historical eruptions, but fumaroles at the summit crater suggest that the volcano is still active. 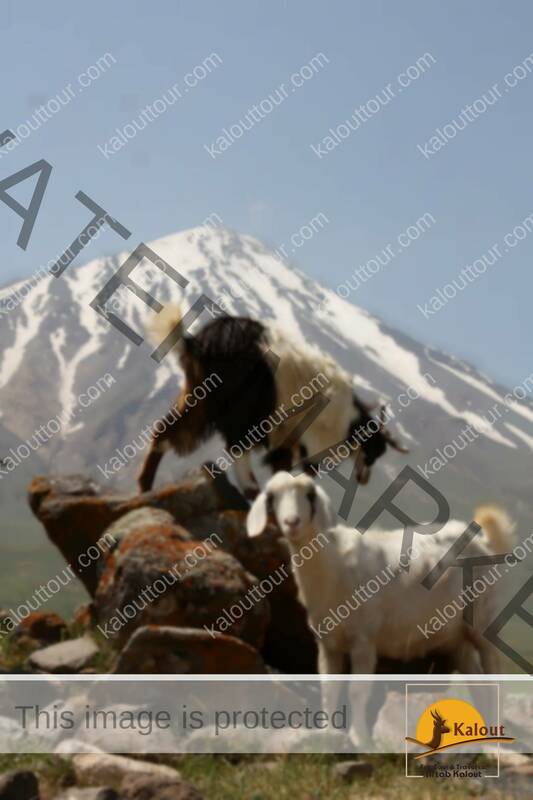 Damavand is located on the tectonically active thrust and fold belt of the Alborz Mountains. It is a massive stratovolcano with a volume of about 400 cubic kilometers and consists of a younger cone that was constructed during the past 600,000 years above an older, 1.78 million years old edifice, remnants of which were previously thought to be part of a caldera. Damavand has only few flank vents. Most activity has been from the summit crater, which has erupted a series of radial lava flows, mostly of trachyandesite composition. Most eruptions of Damavand seen to have been effusive, and only one significant explosive deposit is known, a welded ignimbrite that was produced about 280,000 years ago. The latest activity occurred about 7300 years ago and produced lava flows from the summit crater that cover the western flank. Looming high above the wind-scoured steppes of the Alborz Mountains – the crescent range that divides the Great Salt Desert from the fertile Caspian coast – Damavand’s dimensions make a mockery of its limited renown outside its homeland. Based on its summit’s most widely cited height of 5,671m, this is the highest point in Eurasia west of the Hindu Kush. It’s also the highest volcano in Asia, and it’s this aspect of its physiology that lends Damavand its near-symmetrical lines, the graceful form of a stratovolcano that has lain dormant for 10,000 years. But the thing that had struck me most that first day on the mountain, wending up the vague mule-trails on its north-eastern flank, was how much it transfixed the eye. Though surrounded by lesser peaks in every direction, Damavand still cut an aloof and imperious figure. We’d come here to bag a peak, and found ourselves on a pilgrimage to a country’s geographical heart. As dusk fell, a cloud inversion filled up the northern valleys like a tidal surge, blanketing the lowlands to leave behind an archipelago of mountaintops nudging above a rolling purple ocean. Every ten minutes the clouds’ tendrils clawed up the slope and lapped at our feet. The only direction left to look was up. After a fitful night, we broke camp with the dawn, each lamenting the thin air and lack of sleep. Damavand’s broad topography means that the journey to its summit starts high, and night one had been spent at the already heady altitude of 3,800m. Mercifully, our second day’s trek was a short one, spent engulfed in a mist of condensation that filtered out the scorch of the sun. we climbed over ground covered in hardy, dew-soaked flowers, flourishing in soils made fecund by the ashy deposits of ancient eruptions. Three hours’ march took us to the ice-line at a translucent slick the shape of an inverted teardrop. We stopped to replenish empty water bottles from the glacial run-off, while the guides grumbled about wider issues down on the plains. As we shivered over this forlorn remnant of Damavand’s colder past the country below was feeling the burn. A little past midday, above a cruddy slope of light brown pumice, the base camp hut came into view, looking like a miniature aircraft-hanger around 10m long by 4m wide, its semi-cylindrical roof striped orange and blue. Inside we found a shrine to past expeditions. The gloomy room reeked with the musty smell of anxious nights, while all over the bare-brick walls and sheet-steel ceiling, swirls of Persian graffiti – Islamic invocations and summit posts – reflected the human tendency to leave a mark where humans seldom tread. We unfurled our sleeping bags on a dirty wooden platform, strewn with woven plastic sheets and discarded pistachio husks, and chugged down some sugar-laden tea. The plan for the afternoon was to ascend ‘Himalayan style’, ditching our gear in the hut and then trekking up to 4,900m or so to accustomise lungs to the lofty altitude, before heading back down for supper and sleep. The weather ignored the script of course. Bound by the Englishman’s congenital over-excitement at the sight of weather that’s not drizzle, we scampered outside when the snow started tumbling out of the firmament in heavy, thumb-sized dollops. But this was only a prelude to something more sinister, its coming heralded by a thunderclap of biblical fury and a fizz in the air that crackled in our ears: lightning hunting for a salient point to strike. So much for Himalayan style. For the next four hours we were confined indoors while a scything wind consumed the shelter, jeering us as it rattled the opaque Perspex windows. At 6.30pm, as the light began to fade, quiet finally returned to the mountainside. Their tantrum exhausted, the clouds fled downhill like a sheet being drawn back to reveal a whole new mountain: starkly placid and dressed in two inches of snow. On the craggy promontory that overshadowed the hut, we submitted offerings to a 2m-high, meticulously crafted rectangular cairn in thanks for the turn in providence, and gritted our teeth against the biting chill. The scene below – a replay of last night’s surreal cloudscape – was suitably magical, for this was a mountain swathed in myth. In the Shahnameh, the poet Ferdowsi’s epic 11th-century distillation of Persian folklore, this region was the scene of a showdown between the hero Fereydun and Zahhak, a tyrant king said to have fed his pet serpents on his subjects’ brains. Confronting his nemesis on the slopes of Damavand, Fereydun smote Zahhak with his ox-head mace, imprisoned him within the mountain and usurped the crown. His benevolent rule lasted for 500 years. In the centuries since, the spectacular ridge on which we stood, and which delineates much of the north-east route from here on up, has come to be known as the Takht-e Fereydun – Fereydun’s throne. Zahhak, meanwhile, remains trapped in the earth that lay beneath our feet, his vengeful rages expressed in the sulphurous billows that belch daily from the summit crater. with the sun rising at our backs, we set off up the spine of the ridge, eyes squinting in the direction of the summit – from here a blazing white dome, defiant and still impossibly remote, framed against an auspicious cobalt sky. As long ago as 1837 it had proved straightforward enough for the English explorer W Taylor Thomson to achieve the first recognized ascent, no doubt attired in tweed and probably taking pot-shots at the Asiatic wolves and black bears, now so rare in the region, with his musket. It is 5610 meters high and quite visible from southern Caspian Sea shores. it was listed as the Iran’s first natural heritage and preserved as national natural monument. But I also knew that we had been unlucky with yesterday’s sudden squall. 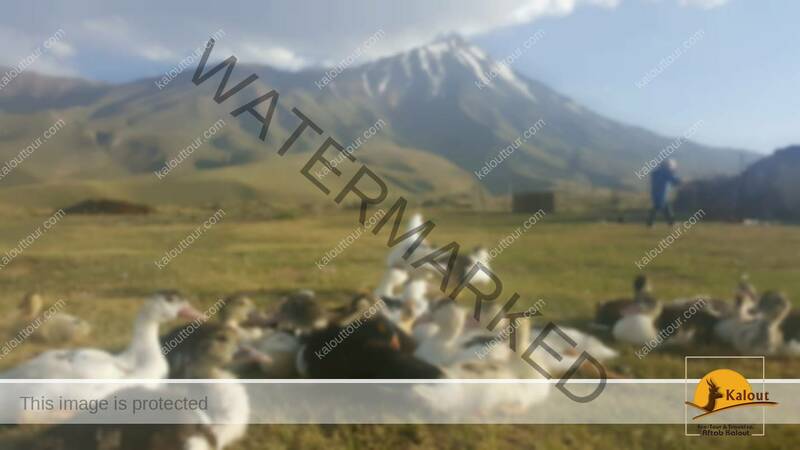 The previous evening, Mohammad, who likes to quantify things, had conceded that Damavand snow showers only occur about 15% of the time in the summer months, and that the snow cover was likely to make the climb around 25% more difficult than it would be otherwise. How much harder could things get, I pondered nervously, if the elements turned again? The digital display on Nasir’s GPS flickered past 5,000m, and we stopped to take stock of rapidly deteriorating conditions. This morning’s plucky breeze had become a biting gale, while an angry carpet of slate-colored cumulus was working its way up the slope to the east, threatening to converge with the wispy penumbra coalescing about the summit. The icy wind had left my extremities numb, and I couldn’t help but recall images of frostbite victims from the Everest disaster book in my luggage, a regrettable choice of holiday reading. Taking on this mountain means dueling with its fickle winds. Like other prominent peaks around the world, Damavand has a weather system all of its own: hot air blowing up from Iran’s parched interior bombards the mountain’s southern flank, yielding storms that are sudden, unpredictable and capable of quashing the ambitions of the most seasoned summiteer. In the early 1970s, the man widely considered the greatest alpinist in history, Reinhold Messner, learned this lesson the hard way when a storm swept in and sabotaged his summit bid. Henceforth, Messner, whose normal playground is the death-zone of the Himalaya, would describe Damavand as “that little hill that defeated me”. At 5,400m we were within touching distance of ‘the gate’, a gap between two rocky outcrops, like a half-finished barricade, through which lay our goal. Cheered by its apparent proximity we urged Nasir onwards. “Ten minutes from here,” said the indefatigable Azerbaijani, fibbing brazenly in a last-gasp attempt to raise our spirits – it turned out to be more like 40. Eventually, at a little before noon, we clambered onto the roof of the Middle East, a barren plateau festooned with ugly, Sulphur-yellowed stones. It seemed a slightly anti-climactic end; enveloped in cloud, we had no sweeping views of the land below and no fresh mountain air. Instead, an acrid smoke contaminated each breath, as fumaroles within the snow-covered crater – the reason behind the rocks’ jaundiced coloration – pumped out a noxious brew of gases from the center of the earth. The stench served as a reminder of Damavand’s earthly purpose: a pressure-valve built by nature to relieve the earth-shuddering friction at the conjunction of the Arabian and Eurasian plates. Even so, at 5,650m, we congratulated ourselves at being the highest earthbound people for thousands of miles around. To find humans suffering at higher altitudes you would have had to travel east to the Pamirs, west to the Rockies, and south to Kilimanjaro. In a fit of clarity that belied my exhaustion, it struck me then that Damavand was indeed an appropriate symbol of the multifarious melting-pot that is modern Iran. Heightened over millennia by the eruption of successive layers of lava, this is a mountain borne of ferment and upheaval. Like the country in which it resides, a hostile reputation had disguised a place that was magnificent to behold and engrossing to explore. For now, it merely slumbered, a sleeping giant waiting to be discovered. The steepest volcanic mountain, Mythical Damavand peak, deserves to be hiked more than 20 times from different faces.